Growing demand for delivering high-speed data connection for different parts of an organization or building and efficient long distance telecommunication is fuelling the demand for fibre optic cables. With the advancement in fibre optics technology, global fibre optic cable demand increased by nearly 20% in 2016 as compared to 2014, whereas China’s demand for fibre optic cable was increased by 85% in 2016. Rising number of fibre to the home (FTTH) projects and network construction projects in countries such as China, Mexico, the US, France, Spain and the UK are propelling the growth of fibre optic cable market. As per the Goldstein Research analyst, the global fibre optic cable demand calculated nearly 324.52 million fibre km in 2016. 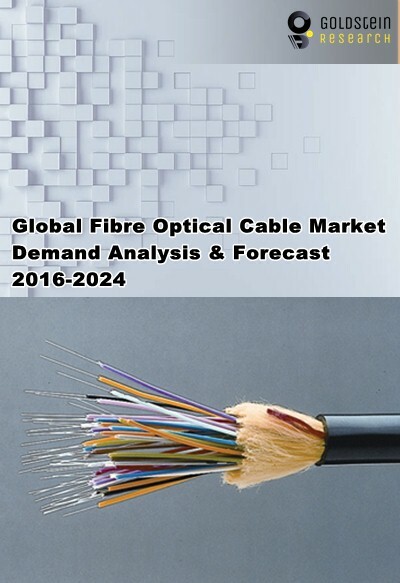 Global fibre optic cable market size valued USD 4.6 billion in 2016, growing at a CAGR of 10.2% during the period 2016-2024. The report covers the present ground scenario and the future growth prospects of the fibre optic cable market for 2016-2024 along with total fibre optic cable demand (million fibre-Km), supply and consumption in every region. We calculated the market size and revenue share on the basis of total cost & sales volume of fibre optic cable across the globe. On the basis of cable type, single mode fiber optic cable occupied 48% of total market share in 2016 is projected to witness healthy growth during the forecast period owing to its low power loss during transmission as compared to multimode fiber optic cable. Multimode fiber optic cable is anticipated to grow at a CAGR of 11% during the forecast period. Fibre optic cable market Outlook 2016-2024, has been prepared based on an in-depth market analysis from industry experts. The report covers the competitive landscape and current position of major players in the global fibre optic cable market. The report also includes porter’s five force model, SWOT analysis, company profiling, business strategies of market players and their business models. Global fibre optic cable market report also recognizes value chain analysis to understand the cost differentiation to provide competitive advantage to the existing and new entry players. Our global fibre optic cable market report comprises of the following companies as the key players in the Fibre Optic Cable market: Prysmian Group, HTGD, AFL, Furukawa Electric, Corning, YOFC , Futong Group, Fujikura and Sumitomo Electric. According to the report, “high efficiency and transmission capacity of fibre optic cable is one of the major drivers fuelling the adoption of fibre optic cable in different industry verticals. As there is no electromagnetic interference in fibre optics transmission and thus fibre optic cable has capability to transmit data at a speed of 10 Gbps.” Further, the report states that complexities in maintenance and operation of fibre optic cables may hinder the market growth during the forecast period. Based on geography, North America region is the dominating region and accounted for nearly 32% market share of total fibre optic cable market in 2016. Asia-Pacific is the fastest growing region and is anticipated to grow at a CAGR of 11.5% during the forecast period. Moreover, expansion of communication networks in Middle East & Africa region is expected to flourish new opportunities for fibre optic cable market over the forecast period. What is the estimated total market size by 2024 and what would be the expected growth rate of fibre optic cable market? What are the technologies and regulatory landscape for the fibre optic cable in every region and what would be the opportunities over the forecast period? What are the current supplies and consumption of fibre optic cable in major countries and what would be the demand over the forecast period?